I hope 2012 is off to a beautiful start for all of you! and with your muses present and lending a helping hand! So, I have a long way to go on this. the Something old, Something new challenge. with only a day or so to complete it. I would get it finished in time. Ha. It's still not finished. 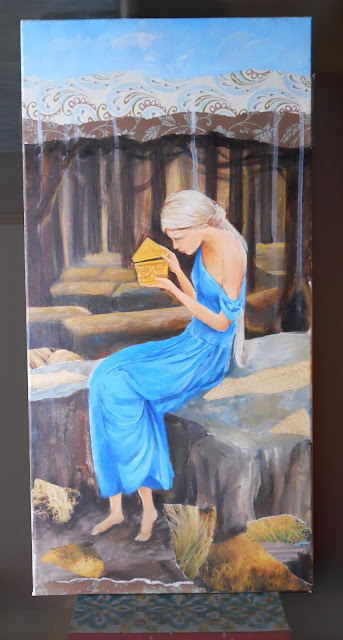 I modeled her after John Waterhouse's Psyche painting. like they could walk right off the canvas. was Pandora, but apparently it is Psyche. I am still calling mine Pandora. 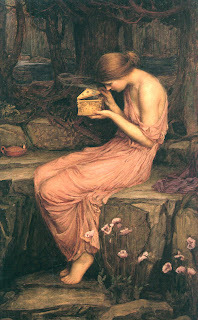 I don't see anywhere in the story of Psyche where she has a box. Psyche is the youngest of three daughters. She was of such extraordinary beauty that Aphrodite herself became jealous of her. The goddess then sent her son Eros to make Psyche fall in love with an ugly man. She was meant to fall in love with the first man she saw, which Eros would make sure was the ugliest man on earth. However, the god himself fell in love with her when he got pricked with his own poison arrow. He visited her every night, but forbade her to see his face, so she did not know who her lover was. On her sisters' instigation she tried to discover the true identity of her beloved. When he lay asleep in her bed, she lit an oil lamp but when she bent over to see Eros' face, a drop of oil from her lamp fell on him and he awakened. When he noticed her intent, he left her. Psyche wandered the earth in search of her lover, until she was finally reunited with him. Zeus himself reunited and married the lovers. A nice story, but where is the box?? Pandora was the first woman on earth. Zeus ordered Hephaestus, the god of craftsmanship, to create her and he did, using water and earth. The gods endowed her with many talents; Aphrodite gave her beauty, Apollo music, Hermes persuasion, and so forth. Hence her name: Pandora, "all-gifted". Not as nice a story, except the part about Hope. Oh, and the stories all say Pandora had a jar, not a box. 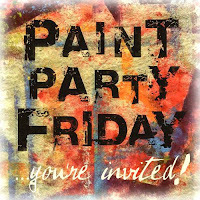 So Happy Paint Party Friday! Oh wow, this is going to be an outstanding piece. You've really started out with a winner.Love the stories behind this as well. Thanks for sharing. I haven't posted mine yet, it's too early over here, but please stop by if you get a chance. Love your piece, Happy New Year. I have a book on Waterhouse so I looked it up for you. "After many vicissitudes, Psyche has been commanded to journey to the underworld with a golden casket, which Properina fills with a secret charm for eternal beauty; Psyche is forbidden to open the casket, but cannot resist the temptation... After opening the box Psyche will fall into a deathly slumber, but Cupid will rescue her. Aha, so the Psyche story continued into the underworld! Her lover Cupid (Eros) to the rescue! The gods were really setting these poor women up...who could resist a closed golden box? Thanks Lisa, that clears it up. Congrats on going big! She is looking fabulous - especially like the way her dress drapes! I didn't know of a box in Psyche's myth.... gotta search wikipedia... The painting is wonderful!! Will you make all the goddesses? Be sure to read WrightStuff's comment above. She explains the box! I really like this, although I totally get what you mean about how you see things on a computer screen that you don't when you're staring at the actual art. I had never heard of Pysche before and didn't know much about Pandora other than her box (in a manner of speaking!) As for parallels - look up the truth about religion on You Tube and you'll see how pretty much all the religions and gods right back in time are pretty much all based on the same storyline - it's a real eye opener. Anyway, I really like your Pandora and look forward to seeing it when you are happy it is completed! This is really wonderful. Love everything about it, especially her pose and way her dress drapes. Happy new year and PPF! I'm really loving your version so far. 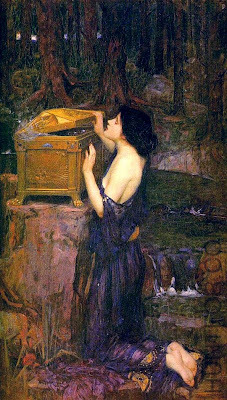 LOL - Pandora's jar indeed - something sure got lost in the translation and I think Waterhouse suffered from confusion. Thank you for sharing the two stories. Your artwork is lovely. Well I love your painting and the story with it. Thanks for adding both stories. They were fun to read. I didn't know about Psyche! Love your interpretation of the original painting! I am really looking forward to seeing how you finish this already wonderful painting! Love the story. :) And a great piece to work on. I mean really. Pandora's jar?!? Hm. I love your version of Pandora. Not being a painter myself, she looks quite finished and totally beautiful. Very lovly piece and a great post. I love your WIP. She is a beauty already. thank your for the legends of Pandora and Psyche. I wonder what those secrets were? !